We aim to demonstrate the feasibility of implementing single-incision laparoscopic surgery in a community setting. Minimally invasive surgical approaches have allowed for the achievement of equivalent outcomes to open surgical approaches while boasting less post-operative pain, improving cosmesis, decreasing lengths of hospital stay and wound-related complications. Surgeons are now attempting to reduce the incisional trauma even further by decreasing the number of incisions required to perform minimally invasive abdominal surgery to just one incision. We report our experience with single-incision laparoscopic cholecystectomy at two community-based hospitals in Honolulu, HI. This is a retrospective case series of patients undergoing single-incision laparoscopic cholecystectomy at two community-based hospitals associated with a university accredited surgical program between September 2008 to June 2011. 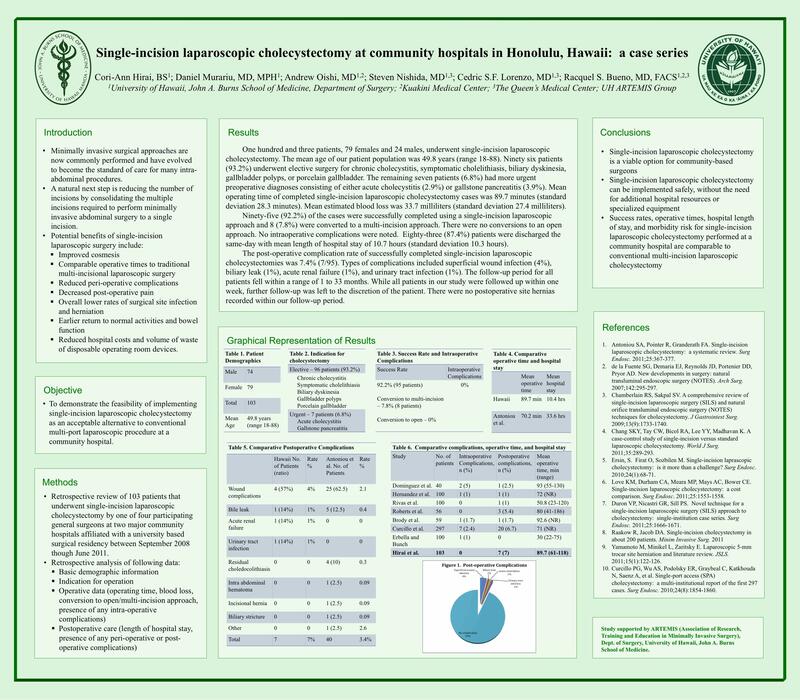 Chart review was conducted for basic demographic information, operating time, blood loss, conversion to open or traditional multi-incisional approach, length of hospital stay, and presence of intra-operative, peri-operative, and post-operative complications. All four surgeons utilized an umbilical incision as the primary, single-incision site. 103 patients (79 females and 24 males) underwent single-incision laparoscopic cholecystectomy. The mean age was 49.8 years (range 18-88). 96 patients (93.2%) were elective cases while 7 patients (6.8%) had more urgent preoperative diagnoses consisting of gallstone pancreatitis (3.9%) and acute cholecystitis (2.9%). Mean operating time was 89.7 minutes (standard deviation 28.3 minutes) and the average blood loss was 33.7 milliliters (standard deviation 27.4 milliliters). Ninety-five (92.2%) of the cases were successfully completed as single-incision laparoscopic surgery and 8 (7.8%) were converted to multi-incisional approach. There were no conversions to an open approach. Most patients were discharged the same-day with mean length of hospital stay of 10.7 hours (standard deviation 10.3 hours). The post-operative complication rate was 7.4% (7/95) and included superficial wound infection (4%), biliary leak (1%), acute renal failure (1%), and urinary tract infection (1%). There were no postoperative incisional site hernias recorded within the follow up period. Our institutions’ outcomes for single-incision laparoscopic cholecystectomy are comparable to other case series reported in the literature. Our complication rates for single-incision laparoscopic cholecystectomy are also comparable to conventional multi-incision laparoscopic cholecystectomy. Single-incision laparoscopic cholecystectomy is a viable option for community-based surgeons and can be implemented safely and without additional hospital resources, illustrating its feasibility in a community setting.